The Seventh-day Adventist Church is the largest denomination of Adventism. The latter is a Christian sect started in the 19th century in the USA by William Miller, a Baptist lay preacher whose followers were referred to as Millerites. When Jesus did not return on various dates Miller suggested — between March 21, 1843 and March 21, 1844 — his followers initially made some allowance for possible calculation errors. But Miller confessed his predictions had failed, and he left the movement. Then, in August 1844 at a camp-meeting in Exeter, New Hampshire, a preacher by the name of Samuel Sheffield Snow — who had been one of Miller’s followers — calculated that the Second Advent would take place on October 22, 1844. The movement subsequently split into various factions. One of these groups was led by Ellen G. White. She had been a Millerite since her teenage years, and had done some itinerant preaching. This became one of the movement’s most distinctive doctrines — one of several unbiblical teachings, ranging from aberrant and heterodox to heretical — that, to this day, set the movement apart from Christian denominations. While she never held title as head of the church, Ellen G. White was one of its founders, and the acknowledged spiritual leader. Joseph Bates, nicknamed the ‘Apostle of the Sabbath’ — and founder of Sabbatarian Adventism, which promoted the seventh day, Saturday, as the Sabbath. Membership losses have grown over the past 15 years. In 2000, 43 of every 100 newly baptized members ended up leaving the church, he said, citing data from the world church’s Office of Archives, Statistics, and Research. The latest figures indicate that 49 of every 100 new members eventually leave. The Adventist Church would have 28.5 million to 30 million members today if none had left over the past 50 years, according to estimates that Ng provided from the Office of Archives, Statistics, and Research. Church membership currently stands at 19.5 million people. Flesh food (meat); Health Message (diet and lifestyle teachings of Ellen G. White. Referred to as “the right arm of the gospel,” and used as a form of proselytizing); Great Controversy (Jesus is in a cosmic battle with Satan and humans help Jesus win); Investigative Judgement (divine judgment of professed Christians has been in progress since 1844); Pen of Inspiration (the writings of Ellen G. White); Present Truth (the revelations of Ellen G. White and the teachings of the SDA Church); Sabbath School (SDA Church’s equivalent of Sunday School); The Testimonies (Ellen G. White’s writing, but in particular a set of nine books titled, “Testimonies for the Church”). The Seventh-day Adventist Church goes to great lengths to try and be accepted as a just another Christian denomination. Some people disagree on whether it should be classified as such. They argue that while Seventh-day Adventism includes a number of doctrines that are outside the mainstream of historic Christian theology, Seventh-day Adventists do accept the essential doctrines of the Christian faith and should thus be considered Christians. 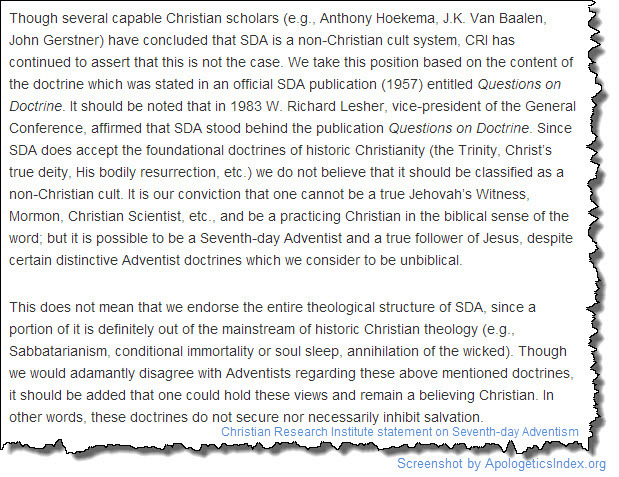 Though several capable Christian scholars (e.g., Anthony Hoekema, J.K. Van Baalen, John Gerstner) have concluded that SDA is a non-Christian cult system, CRI has continued to assert that this is not the case. The full name of that publication is Seventh-day Adventists Answer Questions on Doctrine: An Explanation of Certain Major Aspects of Seventh-day Adventist Belief — usually abbreviated as QOD. It was published after several meetings Walter Martin and some of his evangelical colleagues, including Donald Grey Barnhouse, had with the leaders of the SDA Church. Those meetings came about when Martin had contacted the church in 1955 to make sure he accurately understood its doctrinal positions. Ever since the Adventist church published Questions on Doctrine to convince Martin and Barnhouse that it was not a cult, the organization continued publishing materials endorsing traditional Adventism. In other words, QOD did not alter the church’s doctrines and teachings. Did Adventist leaders lie to Walter Martin? Numerous accounts of this story focus not primarily on the events of the discussions themselves but on their backlash from both within and without the Adventist Church. As many have stated and re-stated, the publication of QOD resulted in more and longer-lasting controversy within the Adventist Church than has any other issue the Church has faced. Walter Martin stated the facts himself on the John Ankerberg Show in 1985. It’s now time to admit that the Adventists did not tell Martin, Barnhouse, and their evangelical colleagues the truth. It’s time to set the record straight. As we noted earlier, in essence Seventh-day Adventism’s doctrines span the range from orthodox through aberrant, heterodox, sub-orthodox 14 and heretical. For this reason, the publishers of Apologetics Index advise Christians not to get involved in Seventh-day Adventism, and urges those who are already part of the SDA church to instead seek out a church that teaches sound, biblical theology. No church or denomination is perfect, but while Seventh-day Adventism does include much that is Biblically orthodox, it includes too much serious error to be accepted within the boundaries of the Christian faith. Even if the Seventh-day Adventist Church would squarely stand behind Christianity’s essential doctrines — and there is enough evidence that this is not so — it mixes in so much poison as to spoil the whole dish. The term can also be applied to groups, organizations or churches whose ‘statement of faith’ or ‘statement of beliefs’ may sound orthodox, but who add aberrant, heterodox, sub-orthodox and/or heretical teachings to such an extend that the essential doctrines of the Christian faith are negatively affected. This 14-page overview gives side-by-side comparisons of the most important issues-and the beliefs that every SDA member holds. Such is the case with the Seventh-day Adventist Church, whose doctrine is at best a confusing mix of water and wine. It is telling that even some apologetics ministries have not picked up on, for instance, the problems surrounding the SDA Church’s version of the doctrine of the Trinity. Most of the church’s founders, including James White and Joseph Bates, openly rejected the Trinity and the deity of Christ. There also is a lot of confusion among Seventh-day Adventist themselves. Those who follow Adventism closely know that the last two decades have been characterized by a deep internal conflict which has divided the denomination and left many Adventist disillusioned. Today, there are various divisions or factions within SDA. Some wish that Adventism would fully enter into the evangelical mainstream, while maintaining certain Adventist distinctives. Others, the more traditional or fundamentalist Adventists, often reject portions of Questions on Doctrine and seek to hold on to several heresies which arose early in the Adventist movement, such as the investigative judgment, the sinful nature of Christ, and viewing Ellen G. white as the infallible interpreter of Scripture. It is the division of Adventism, who often refer to themselves as “the remnant church,” or God’s exclusive agent, that CRI would regard as being cultic. Some within this camp would anathematize all of Protestantism, arguing that as Sunday-keepers they will receive the mark of the beast just prior to Christ’s second coming. Admittedly, this is the extreme part of SDA, but nevertheless well represented. 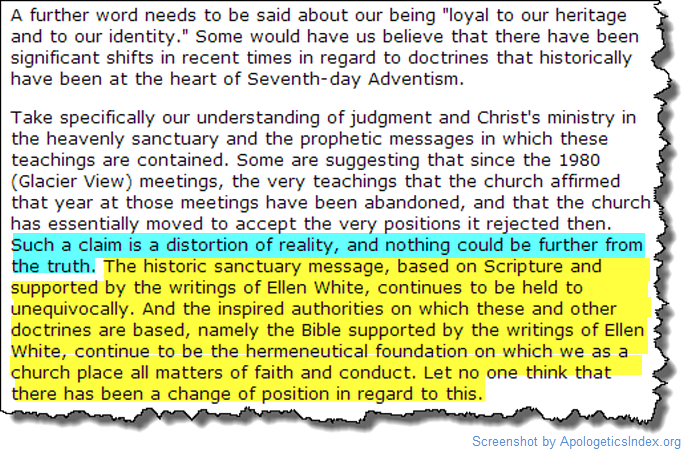 That undated statement, which is at least more than a decade old, makes it appear as if there is within the Seventh-day Adventist Church a group of Christians who adhere to biblically sound doctrine — even while they remain part of a movement that teaches many false doctrines. The crisis that exists within SDA today essentially centers around the investigative judgment, an unbiblical doctrine which severely compromises if not outright denies the biblical doctrine of justification by faith. Second only to the investigative judgment issue is the all-encompassing question of the inspiration and authority of the writings of Ellen G. white. The controversy which has raged regarding the writings of Mrs. White has undoubtedly shaken the entire structure of SDA. The ‘investigative judgment‘ is a doctrine unique to the Seventh-day Adventist Church, which claims that a divine judgment of Christians has been in progress since 1844. The blood of Jesus shed on the cross transferred the sins of professing Christians up into heaven, where they are “stored” and defile the heavenly sanctuary. Jesus’ atonement wasn’t completed on the cross; it continues until he finishes investigating the heavenly “books of record,” maintained by a “recording angel,” that shows the thoughts and deeds of all professing Christians. One day Jesus will place unconfessed sins back onto the people who committed them, and they will be punished. But Jesus will place Christians’ confessed sins onto the head of Satan, the scapecoat, and he will be punished for them in the lake of fire. When Jesus finishes his investigation, Christians who attain perfect obedience must withstand the “Time of Trouble” without Jesus as their intercessor. Sabbath-keepers will thus refute Satan’s accusations against God and vindicate the fairness of his law. The pamphlet further notes that Adventist scholars admit that without the investigative judgement, there is no reason for the Adventist Church to exist. There is no way that a Christian interested in sound doctrine can accept those kind of teachings. It will be worthwhile to take a closer look at Ellen White, given the prominent place she had in SDA history, and the reverence accorded her by most Seventh-day Adventists. Rose Publishing goes right to the point. In its pamphlet on the SDA Church, it compares Adventism’s claims regarding White versus what the Bibles teaches about modern revelation and the testing of prophets. Nevertheless, the Seventh-day Adventist Church continues to revere and promote White as the Lord’s end-time messenger, claiming that she and her “testimonies” represent “the spirit of prophecy” foretold in Revelation 19:10. 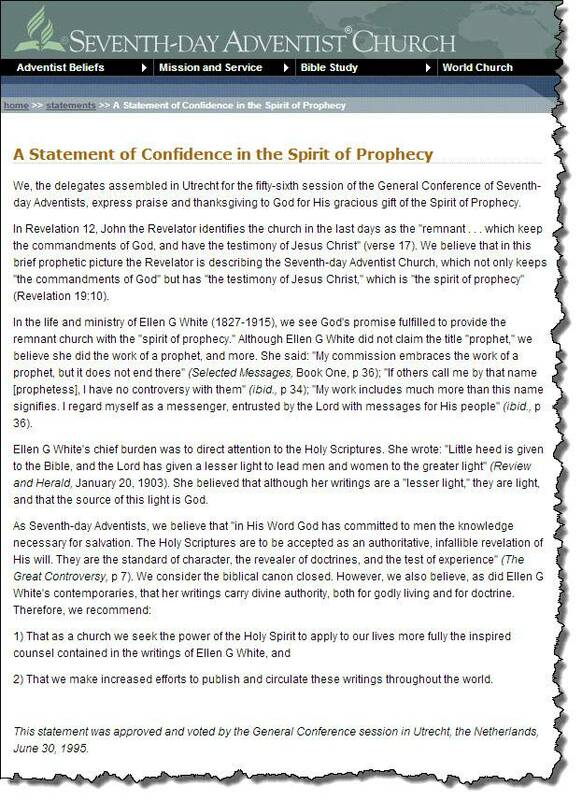 While the Christian Church has historically interpreted that phrase as a reference to the Holy Spirit, who imparts the gift of prophecy (as one of a number of spiritual gifts) to Christians, the Seventh-day Adventists Church sees a reference to Ellen G. White. In Revelation 12, John the Revelator identifies the church in the last days as the “remnant . . . which keep the commandments of God, and have the testimony of Jesus Christ” (verse 17). We believe that in this brief prophetic picture the Revelator is describing the Seventh-day Adventist Church, which not only keeps “the commandments of God” but has “the testimony of Jesus Christ,” which is “the spirit of prophecy” (Revelation 19:10). There are many issues we have not (yet) (fully) addressed here, including the Seventh-day Adventist Church’s view of Jesus; its teachings about man and the state of the dead; the ‘Great Controversy’; or the church’s insistence on the observation of the Sabbath on Saturday. 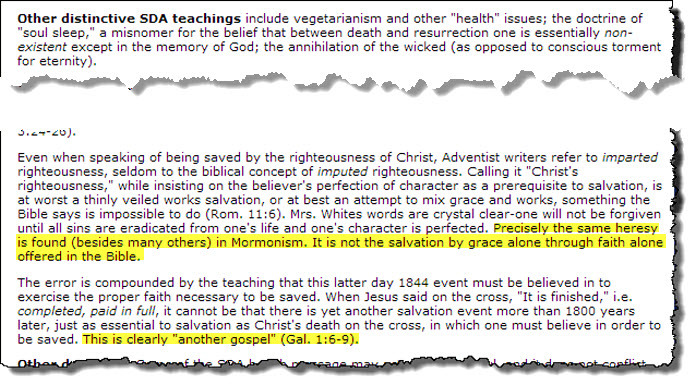 Then there is the SDA Church’s belief that it is God’s unique “Remnant Church”; its use of The Clear Word Bible (which inserts Ellen G. White’s teachings with no basis in the original Bible manuscripts into the text); its ‘Health Message’ (which, calling it “the right arm of the gospel,” Adventists use in their proselytizing efforts 22); and its deceptive recruiting practices. We believe that these issues and more are adequately covered in the research resources we list below. We encourage readers to examine the claims and teachings of the Seventh-day Adventist Church, and to compare them to what the Bible actually teaches. We highly recommend this colorful, laminated fold-out pamphlet as a good introduction to SDA Church teachings as contrasted with those of Christianity. 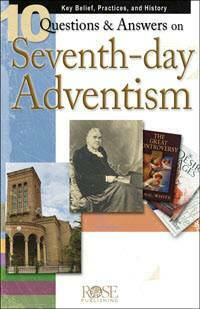 The pamphlet answers such questions as: Why do Seventh-day Adventists worship on Saturdays only? Who was their prophet, Ellen G. White, and what did she teach about Jesus (identified as Michael the Archangel), the Trinity (both God the Father and Jesus have tangible bodies), and salvation? What is the SDA Bible paraphrase, The Clear Word, and how does it alter the original Greek and Hebrew meanings to fit Mrs. White’s unusual teachings? Why do Adventists consider Sunday worship “the mark of the beast?” What is the “investigative judgment,” and how does it deny the biblical belief that Jesus paid fully for our sins at the cross? It was authored by former Seventh-day Adventists Colleen and Richard Tinker, with contributions by Jeremy Graham and Jim Valentine. General Editor for the project was Paul Carden, Executive Director of Centers for Apologetics Research, and former co-host of the Bible Answer Man radio program. Note: additional research resources will be added. You are welcome to suggest such resources. The listings are color-coded. Sources produced by Seventh-day Adventists, either in a lay or official capacity, have been color-coded ‘brown’ to reflect our understanding that while the Seventh-day Adventist Church professes to be Christian it is outside orthodox Christianity. Brief look at the Adventist teaching of “investigative judgment” by Tyler Ramey. See also. The Clear Word Bible: Is it the Word of God? [contra] by Dale Ratzlaff and Verle Streifling. This article, hosted by Watchman Fellowship, documents how The Clear Word Bible goes beyond merely providing a paraphrase by altering Scripture to make it line up with Adventist teachings in general, and the writings of Ellen G. White in particular. An Unbiblical Understanding of Christ’s Work of Atonement. An Improper Elevation of Ellen G. White as an Authoritative Prophetess. A Legalistic Emphasis on the Sabbath and Dietary Laws as Binding for Christians. Facts Seventh-day Adventists Won’t Tell You At Their Seminars As part of it proselytizing efforts the SDA Church puts on interesting seminars on subjects ranging from archeology to prophecy — often without informing people that the Seventh-day Adventist Church is the entity behind those seminars. Here’s what else they won’t tell you. 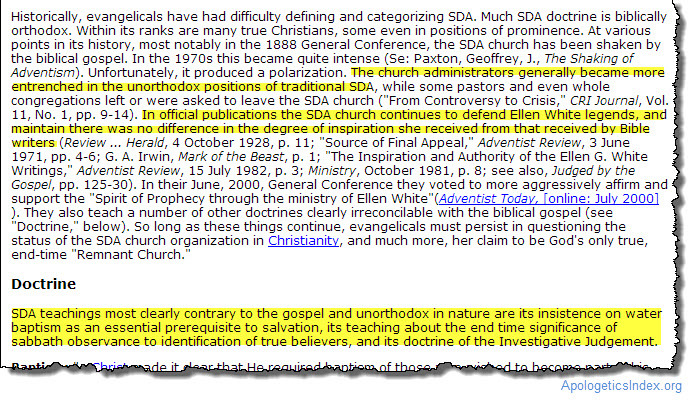 , which compares the SDA Church’s Great Controversy worldview with a Christian worldview. Seventh-day Adventism Position statement by the Christian Research Institute. Be sure to read this information. [contra] Former SDA pastor Dale Ratzlaff shares how to minister to transitioning Seventh-day Adventists. See a summary here. Walter Martin interview “Walter Martin, Christianity’s cult-watcher discusses Adventism in trouble,” from Adventist Currents, July, 1983. 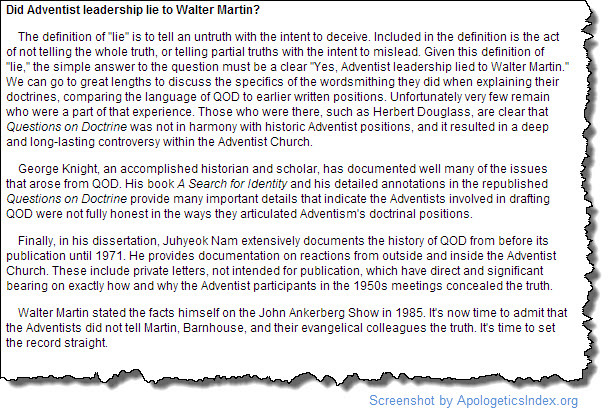 Make sure you also read, Did Adventist leaders lie to Walter Martin? Seventh-day Adventist Renounced [contra] by D. M. Canright, who was a leader in the movement for 28 years. First published in 1889. Youtube has many good videos on the doctrines and practices of Seventh-day Adventism. We want to highlight this one by former SDA preacher Dale Ratzlaff: Three Adventist Doctrines that Compromise the Gospel. Adventist Cult Misconceptions [pro] Appear to be an individual’s efforts at answering critics of the SDA Church. 50 Questions and Answers. Bible Studies for Adventists “Presenting a Biblical response by concerned former Seventh-day Adventists to the Sabbath School Bible Study Guide.” Editor behind the project is Colleen Tinker, who is also the editor of Proclamation! magazine. Former Adventist Fellowship [contra] A place where former and questioning Seventh-day Adventists can fellowship and study with others who have discovered that Jesus is their true Sabbath Rest. Proclamation! Magazine Thie quarterly magazine, intended for former Seventh-day Adventists, inquiring Adventists, Sabbatarians, and concerned Christians, can be read online. Its mission is “To proclaim the good news of the New Covenant gospel of grace in Christ and to combat the errors of legalism and false religion.” An excellent resource. The Great Hope Exposed [contra] This website exposes the non-biblical worldview in The Great Hope (sometimes named The Great Controversy) — a book distributed by the Seventh-day Adventist Church as part of a massive outreach campaign. This page of research resources on the Seventh-day Adventist Church is written and maintained by Anton Hein, founder and team member of Apologetics Index. Anton lives and works in Amsterdam, Netherlands, with his wife, Janet, who was born in England but raised in Ireland (and is more Irish than English). They are involved in helping people leave cults, abusive churches or abusive relationships. When Anton is not typing something or other, he’s probably either taking photos somewhere in Amsterdam, brewing quality coffee, or creating super-spicy home-made Mexican salsas. Regarding this teaching, see Romans 14 — particularly vs. 5 and 6: “One person considers one day more sacred than another; another considers every day alike. Each of them should be fully convinced in their own mind. Whoever regards one day as special does so to the Lord.” Plain language that in just two sentences soundly refutes those who make keeping the Sabbath on a certain day a requirement for salvation. Iglesia ni Cristo is theologically a cult of Christianity. See examples showing how the Seventh-day Adventist Bible paraphrase, The Clear Word, changes dozens of biblical passages to add in Ellen G. White’s unusual doctrines. SDA’s believe that worshipping on Sunday is the mark of the Beast (a sign you are not a true Christian). Also included are tips on how to reach out to Adventists.